Description: This style offers additional coverage to our Constance, 9MS097 gown. 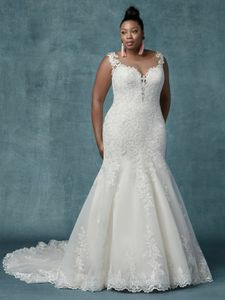 Embroidered lace motifs drift from bodice to hemline in this classic wedding dress, completing the illusion plunging sweetheart neckline, illusion cap-sleeves, and illusion back. Finished with covered buttons over zipper closure.